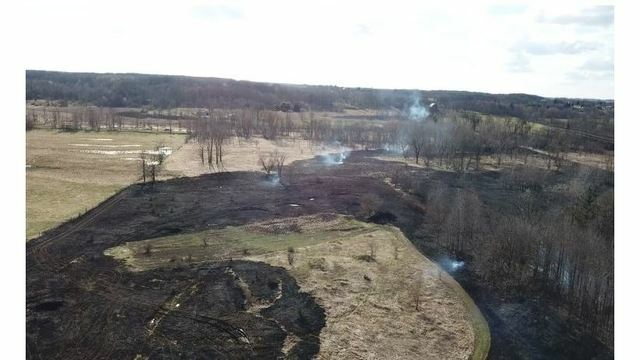 VERMONTVILLE, Mich (WLNS) - You might think the threat of brush fires is not great this time of year because of the rain we've had. That would not be true. Fire danger is very real right now. The Charlotte Fire Department posted video the department's Facebook page showing the extent of damage from brush fire Tuesday. It happened around 5 p.m. near the intersection of Ionia Road and Kinsel Highway in Vermontville. Charlotte firefighters were called in to help the Vermontville Fire Department. It's not known what caused the fire. Brush, grass and forest fires account for almost one-quarter (23%) of fires handled by local (municipal or county) fire departments. The vast majority of brush, grass and forest fires in 2011-2015 were caused by humans. Leading causes include intentional fire setting, open burning of waste, smoking materials, and electrical power or utility lines.